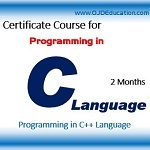 The C Programming Language course is designed to give you everything you need to become a productive C programmer. C is a simple yet powerful multi-purpose programming language that sits at the heart of virtually every computing device imaginable. It offers unparalleled performance and supports the widest breadth of devices and platforms. It is ideally suited to environments with strict, real-time constraints like kernel-mode and in particular to embedded systems programming. Whether you plan on learning C as a foundation for C++ or to prepare yourself for embedded programming, this course will give you a solid foundation and show you that C need not be feared.